A great big green salad to serve alongside all the meat. 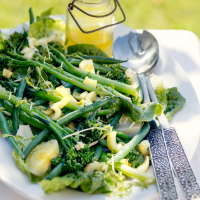 Cooking the celery softens its flavour and, along with the grapefruit, it creates a fantastic dressing. 1. For the dressing, simmer the celery in a large pan of salted water for about 3-4 minutes, until tender. Remove with a slotted spoon and run under cold water until cool. Pat dry on kitchen paper, then dice finely and add to a bowl with the remaining dressing ingredients; season. Mix well, cover and refrigerate for at least a few hours, preferably overnight. 2. When ready to serve, bring a pan of salted water to the boil. Add the beans and cook for 1 minute, then add the broccoli and cook for 3-4 minutes, until both are tender. Drain and immediately run under cold water until cool. Pat dry, then mix on a serving plate with the lettuce and snipped cress tops. Spoon over most of the dressing, serving extra on the side, if liked.